The sunset seen from Tokyo Metropolitan Government Building (Kenzo Tange) in West Shinjuku. View of opera city and the Metropolitan Expressway. The city as model. Akihabara. A map of the administrative borders of Tokyo-to. 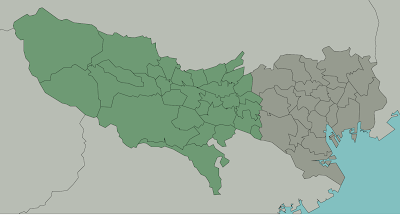 To the east in darker green, Tokyo 23, and to west the Tama district of Tokyo. South of Tokyo Kanagawa-ken, to the west Yamanashi-ken, north is Saitama-ken and to the east Chiba-ken. The 23 Special Wards that make up Tokyos city centre is under central administration to a certain degree, they are the least free cities in Japan, but they are still not one city. Tokyo is not one, Tokyo is many different parts that are put together. All maps are reductions, this one is only showing built up structure of a certain kind. The kind more likely to burn. Here the city is visible as a thins down around the most central spot. 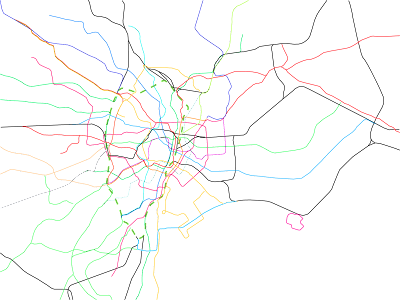 Tokyo is famous for it complex networks of trains that transport enormous amount of people every day. Here the central section of the railway network. A map consisting of build structure. Built structure classified by how resistant the structure is to damage. Also a hint of the morphology of the city. 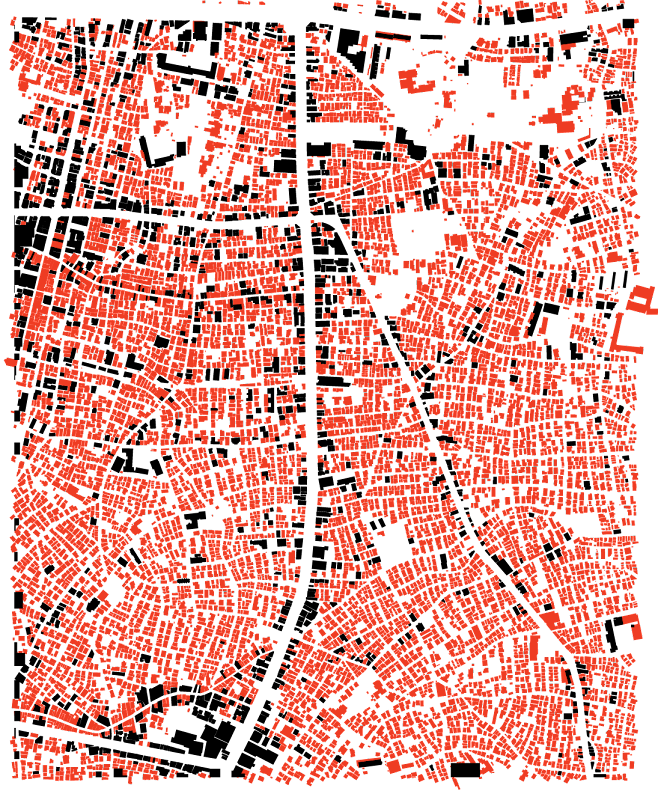 And finally a map of where we began, in Shinjuku, looking down on city and seeing the mixture of scales a the complete mess of spaces, however, there is only so much these maps tells us, even if we are used to looking at maps, without further knowledge of the context they come from. Let us begin here looking at an anonymous buildings catching the lights of St Grace Cathedral. Contemplate how the lights shine on this concrete façade. Surely this is architecture. See this building; it is not a cathedral, it is a wedding chapel close to Ometosando. Surely this is also architecture, but of a different kind. Or maybe order. But one building brings light to the other. Watch a woman walk on narrow street partially illuminated by the lights of a delivery truck. Move to Aoyama-dori and see Fumiko Makis Spiral (1985) building. The top part reflecting the red lights of a billboard. Named after the way people flow up through the building in a spiral movement. Pause in the crossing of Aoyama-dori and Ometosando. Cross Aoyama-dori and follow Ometosando and Pradas Aoyama Epicenter (H&dM 2003) is even more architecture, in a purely quantifiable way.